Something monstrous looms in the murky water, a strangely fluid shape the size of a horse. As it draws near, the thing unfolds, a writhing nest of pale hook-lined tentacles connected by rubbery flesh, at the center of which snaps a razor-sharp beak. The monster’s body is deep purple, fitted with powerful fins and a pair of immense sapphire eyes that sparkle with malevolent hatred. Lately the increase in worship of the Alien Devil God Dagon, has resulted in more frequent Devilfish attacks and sightings within the Thunder Sea. They are not as common farther out, and virtually unheard of as far north as The Lhazaar Principalities. Spd 10 ft., swim 40 ft.
During Combat A devilfish prefers to grapple foes, peel back their skin like fruit, and drop them in a puddle of their own gore. It takes a disturbing glee in tormenting foes, and when attacking a lone target, a devilfish attempts to draw out the victim’s death as long as possible. Morale A devilfish uses its jet ability to escape peril if brought below 10 hit points. Dagon’s Blood (Su) The unholy blood of the sea god runs through a devilfish. Once per day, as a standard action, a devilfish can emit a night-black cloud of this foul liquid, filling a 20-foot-radius cloud if underwater, or a 20-foot-radius burst on land. In water, the blood provides total concealment for everything but a devilfish (which can see through the blood with ease), while on land the slippery blood coats the ground (making the area difficult terrain). The blood persists for 1 minute before fading. Anyone who enters a cloud of the blood in the water or who is within range of a land-based burst of the stuff must make a DC 16 Fortitude save or be nauseated for 1d4 rounds. The save DC is Constitution-based. Jet (Ex) A devilfish can jet backward once per round as a full-round action, at a speed of 240 feet. It must move in a straight line, but does not provoke attacks of opportunity while jetting. If it hasn’t used its Dagon’s blood ability, it may activate the cloud of blood as part of its jet. 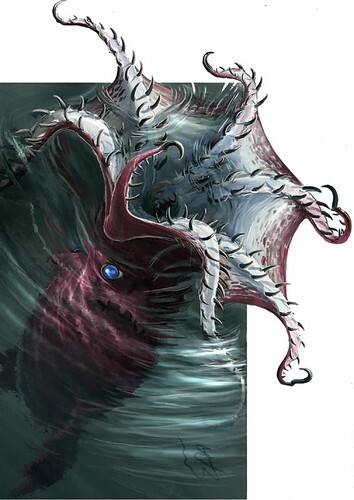 Improved Grab (Ex) To use this ability, a devilfish must hit a creature at least one size category smaller than itself with its tentacle attack. It can then attempt to start a grapple as a free action without provoking an attack of opportunity. If it wins the grapple check, it establishes a hold and can attempt a savage bite attack as a free action. Poison (Ex) Injury (savage bite), Fortitude DC 16, initial damage 1d6 Strength, secondary damage 1d6 Strength. The save DC is Constitution-based. Savage Bite (Ex) A devilfish can attack with its savage bite whenever it makes a successful grapple check. The bite threatens a critical hit on a roll of 18 to 20, and injects the target with poison as well. See in Darkness (Su) A devilfish can see perfectly in darkness of any kind, even that created by a deeper darkness spell or its Dagon’s blood ability. Water Dependent (Ex) A devilfish can survive out of the water for 1 hour, after which it becomes fatigued. After 2 hours, the devilfish becomes exhausted and begins to suffocate (see the drowning rules on page 304 of the DMG). he descended on the great kraken and tore her to pieces. Yet while Kaktora was slain, Dagon’s blood filled the waters in which the countless fragments of her corpse floated. These fragments absorbed the sea demon’s blood, twisting and transforming into a new life of their own. What swam out of that legendary battleground were the first devilfish, born from violence and raised on the blood of a demon god. Devilfish are often mistaken for octopi, but they are in fact rather intelligent. Their tentacles are connected by a thick webbing, and when the creature attacks it does so with all seven of these hook-lined arms. Fishermen tell stories of devilfish purposely hooking themselves on lines just to increase the chances of capturing and capsizing fishing boats—often, even rumor of a devilfish sighting is enough to keep an entire fleet of fishermen on land for a week. Devilfish are larger than common octopi, their bodies on average growing 10 to 12 feet in length. These sick brooding sea monsters are also far more cunning than many other aquatic predators, luring prey into ambush, most often by allowing creatures to believe they are safe on dry land and then suddenly lurching out of the water to attack. Dagon’s blood gifts devilfish with unnaturally long lives and they continue to grow until the moment of their death. A few devilfish have survived for centuries below the waves, plaguing shipping lanes for generations. Some specimens reach terrifying proportions, dwarfing the greatest megalodons and pulling the mightiest Brelish warships below the waves with a casual tug of one tentacle. Devilfish only require sustenance every few weeks to survive, but most gorge themselves whenever prey is available. Devilfish hate their own kind as much as they hate everything else. They are solitary creatures who hide from men’s eyes except when they are overcome by the urge to feast. Devilfish are asexual, and can produce offspring three or four times during their lives by disgorging a small clutch of live young. The parent immediately abandons these young, who fight and feast among each other until only one survives. This lone devilfish grows quickly, reaching maturity in just a few weeks after a voracious feeding frenzy that usually involves the depopulation of schools of fish and pods of dolphins. The majority of devilfish encountered along coastal waters are little more than monsters gifted with just enough intelligence and cruelty to enjoy their murderous ways. Yet in the deep ocean trenches of the world dwell the gutaki, said to be the most direct descendants of the ancient kraken Kaktora. The gutaki have taken to the worship of Dagon with fanatic fervor, venerating him as their creator, for without his wrath and blood, the fragmentary remains of the Mother would have rotted to nothing. The gutaki have very little contact with surfacedwelling races, for unlike the typical devilfish, they are not amphibious. Adapted to life in the tremendous pressures of the depths, they even fare poorly in the upper reaches of the sea. The average gutaki has an Intelligence score of 12. Their cities are said to be things of both beauty and madness, to rival even those of the ancient aboleths, with whom these cruel beasts have warred for countless eons. Devilfish have plagued the seas for ages, and most sea captains can spin a tale or two about them. Birth Brings Death: Women are ill luck at sea to some captains, more so when pregnant. Devilfish crave the souls of unborn babes and infants, and can smell a woman with child miles off. Many captains refuse to allow pregnant women aboard their vessels, and if they discover a woman on their ship who starts to show, they let them off at the closest port— the most cruel might even toss them to the unforgiving sea. The Change: It is said that each octopus harbors a devilfish in its mysterious soul. Any octopus can become a devilfish at any moment, when the change comes upon it. Some transform when they pass through bloody waters, or when a tussle with a shark or other predator brings out their dark side. Some coastal communities hunt octopi to extinction in their region for this reason, leaving beaches strewn with severed tentacles and savaged bodies. Marked by the Devil: Anyone who survives a devilfish attack turns to murder and evil. The taint of a devilfish’s tentacles darkens his soul forever, and it’s only a matter of time before the survivor kills the innocent. More than a few survivors of devilfish attacks have been preemptively slaughtered by their friends and neighbors shortly afterward due to this taint.